Handling sensitive data usually requires you to consider protecting it one way or another. Instead of storing it on various media, it is possible to choose an encryption tool and prevent others from viewing it or tampering with its content. If you find yourself in this situation, Cryptex can help you secure your documents in a quick and efficient manner. Note that this application requires Microsoft Chart Controls installed on your computer to run as intended. This program does not require any installation since it comes in portable form. Additionally, it does not modify Windows registry entries nor create additional files or folders. It packs a comprehensive user interface that encompasses neatly organized functions, thus allowing you to access them without great efforts. Note that you need medium to advanced PC skills and a good understanding of encryption concepts if you want to understand and use this application to its full extent. 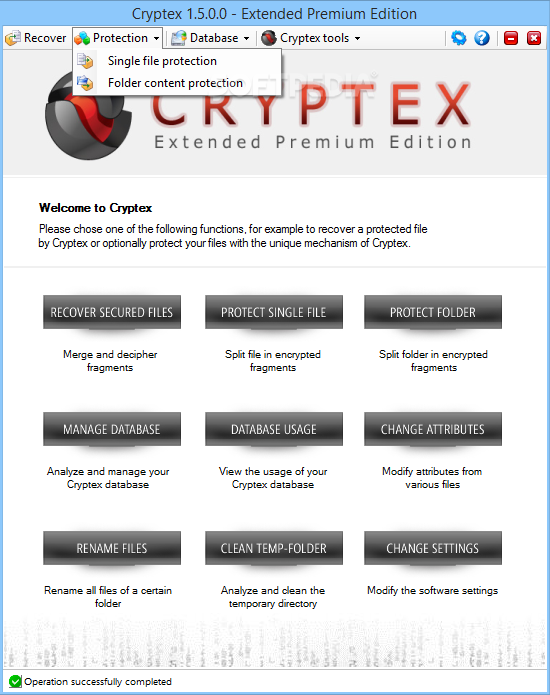 You can rely on Cryptex if you are looking for a reliable file encryption tool that provides you with various efficient functions. This application divides your documents into several encrypted items and stores them within a database, allowing you to organize your content in an efficient manner. Every processed item is protected by a user-defined password. Recovering protected content can be achieved easily by clicking the corresponding button. After typing the valid password, the program merges the encrypted content, deciphers it and allows you to access the original document. Aside from the functions mentioned above, this application provides you with various other handy tools, such as an attribute changer and a batch file renamer. Additionally, it allows you to analyze and clean the temporary directory. To sum it up, Cryptex is a portable, powerful file encryption and decryption tool that allows you to secure your documents in an efficient manner and recover them just as easily. Additionally, it provides you with several additional functions that might come in handy.